With school back in session and the weather getting colder, every parent’s worse nightmare – cold and flu season – will be here soon. As any parent can tell you, that means trying to help your kids fend off illnesses while hoping they don’t come down with the popular sickness that is being passed around at school like candy. And one of the most handy weapons in a parent’s arsenal, the lowly thermometer, is even getting a smart makeover. The top of Kinsa’s device looks like any run-of-the mill thermometer, but the bottom features an audio jack that plugs into your iPhone’s headphone port. Getting the thermometer up and running was quick and simple. After downloading the companion app, you’ll go through a quick calibration process and be ready to go. Since it plugs directly into your iPhone, or used with the included extension cord, the thermometer itself is very light and doesn’t require any batteries. The thermometer can be used with the included extension cord or plugged directly into the iPhone’s audio jack. Through the app, you can set up individual profiles for everyone in the family – even mom and dad. Along with being able to look at previous readings for each specific family member, which can be invaluable when tracking illnesses and determining when your child can return to school, you can add specific notes and enter symptoms. If you need to make a trip to a medical professional, that information could very easily help a doctor make a correct diagnosis. In my testing, I found the thermometer was very accurate. You can use it to take a reading orally, under the arm, or rectally. I compared two other oral thermometers I own that are extremely accurate, and the Kinsa was within 0.1 degree Fahrenheit during each test. At least orally and under the arm, it took about 10 seconds to register a reading. To help combat squirmy kids, the app will let you know if the thermometer needs to be moved to a better place in the mouth, which is a big help. Another huge plus is the fun bubble popping game that appears on screen for kids to play while the thermometer is taking a reading. My 4-year-old son, who absolutely hates having his temperature taken, enjoyed it so much I found him trying to take my iPhone just to play that game. The app is well designed and is a great place to keep track of your family’s health. Kinsa has also created an interesting social networking feature. You can join a local group made of other users from your children’s school or your own workplace. Users can anonymously share information about illnesses going around. Sadly, no other parents had joined the groups for my children’s schools, but hopefully that will change. 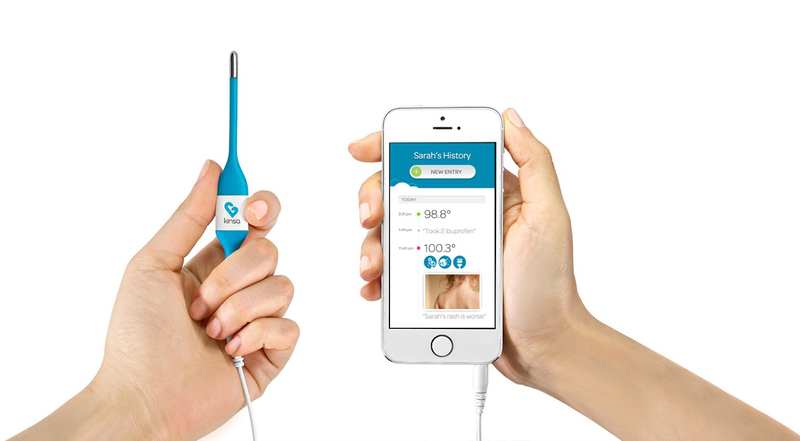 Interestingly, if you can be patient, Kinsa has recently announced a second-generation device that tackles many of my issues with the current model. 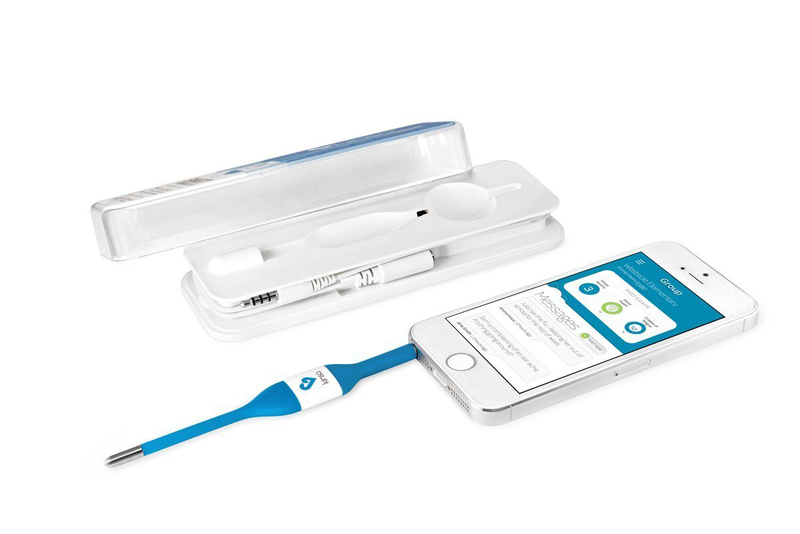 The company’s Smart Ear Thermometer has recently launched on Indiegogo. 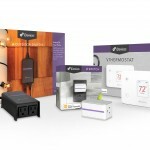 It’s wireless, thanks to built-in Bluetooth, and does have a display to show the temperature readings. You can snag one now for a $40 pledge, $20 off the expected retail price. Shipping is expected to begin in November. The new model will also work with the Kinsa app. But if you can’t wait that long, or have kids who don’t respond well to ear thermometers, Kinsa’s current model is highly recommended. The wonderful app makes it perfect for any parents with young children. While I hope to not use it this winter, I’m glad I’ll have a simple and easy way to keep track of my children’s health. Can be used orally, under the arm, or rectally. 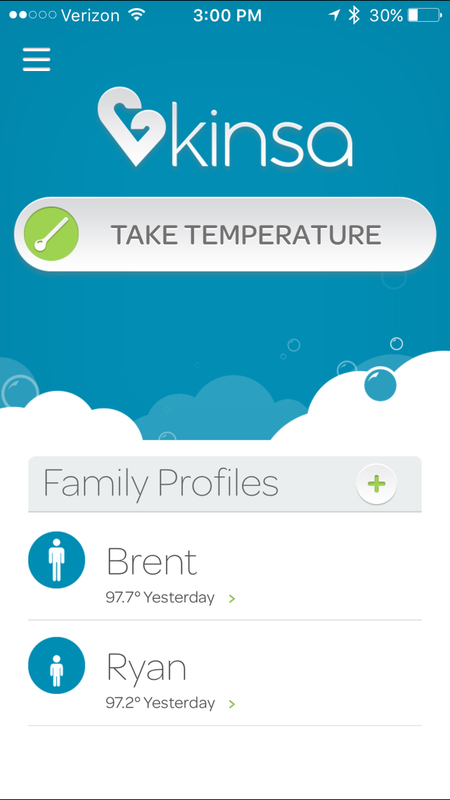 Fantastic companion app saves temperature readings and other health information. Can share data with Apple’s Health app. Readings took around just 10 seconds. The Groups feature is a great idea. Needs to be connected to your iPhone’s audio jack or used with the included extension cord. Thermometer doesn’t have a display. Data doesn’t sync between devices.